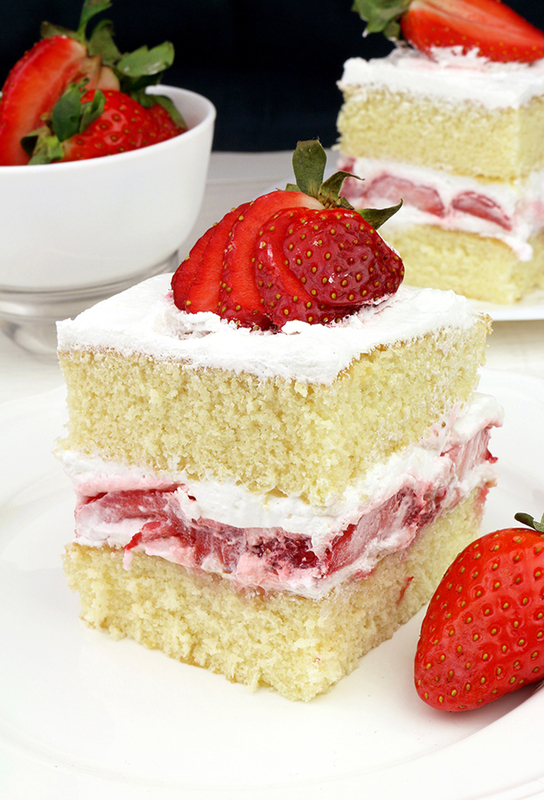 This simple old fashioned dessert is perfect for upcoming strawberry season. 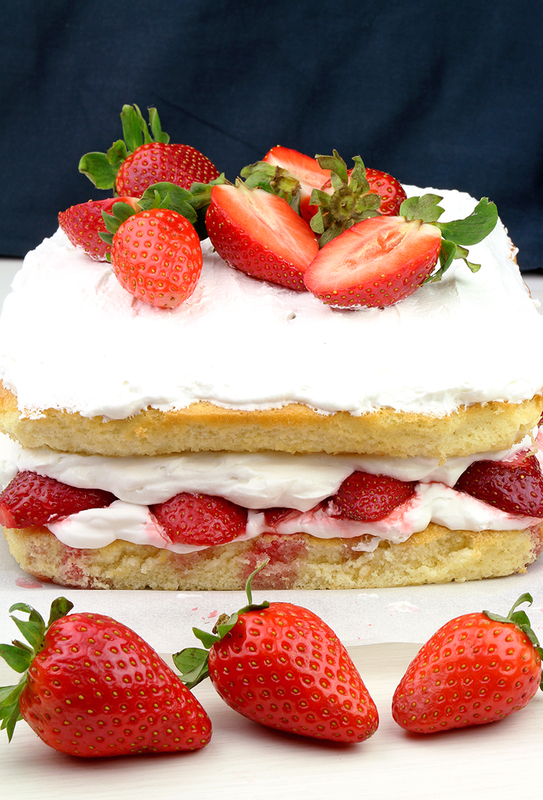 Strawberry Shortcake is quick and easy to prepare and you will love its simple, yet perfect taste. Spring is near and fresh strawberries, too. Warm, sunny days make us all smile and give us that extra energy we all need after long, cold winter. So, wake up and use this spring spirit in the kitchen, as well, by making something delicious for you and your loved ones. 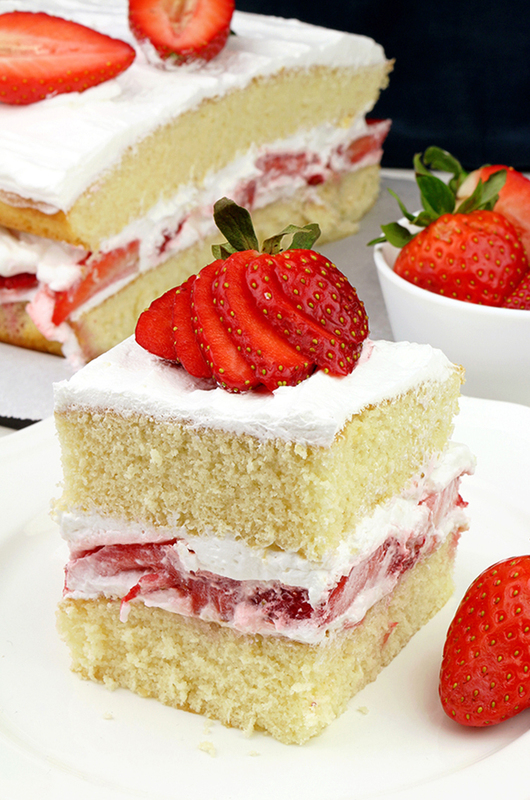 Strawberry Shortcake is a favorite dessert to many people. All the basic ingredients you can find in your kitchen – flour, eggs, milk, butter, heavy cream, strawberries, add some good will and you are ready to start preparing this perfect spring dessert. You will love the smell coming out of the hot oven while the cake is being baked. Everyone in my family really like this cake, especially my son.. Strawberry Shortcake is quite big but it doesn‘t take long for it to disappear. 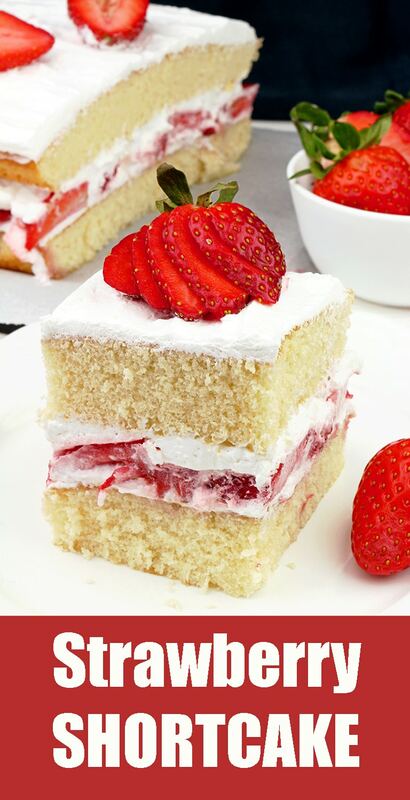 I love strawberries – fresh with cream, in salads like Strawberry Pineapple Fluff Salad or Strawberry Spinach Almond Salad, in No Bake Strawberry Cheesecake and Fresh Strawberry Cream Cheese Cake. Homemade Strawberry Ice Cream is a real treat. During the strawberry season I often prepare Strawberry Banana Baked Oatmeal Cups or Easy Strawberry Nutella Chimichangas for breakfast. I enjoy spring, sunny weather and fresh strawberries.. 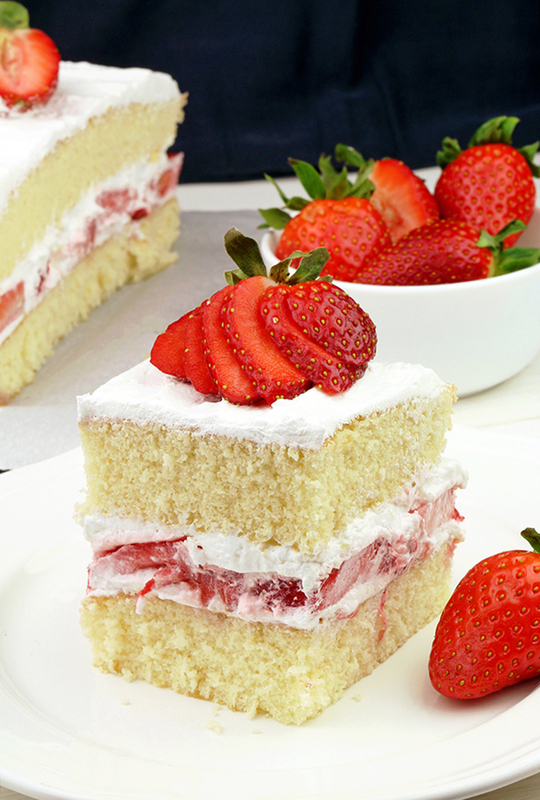 I love spending time with my family and friends, enjoying the magical taste of Strawberry Shortcake. Enjoy! You can prepare this dessert for no reason, whatsoever, but it is also perfect for Mother‘s Day or any other holidays or special occasions. Preheat the oven to 350 F. Line 2 9x13 baking pans with parchment paper or spray with non stick spray. Set aside. In a large dish combine flour, baking powder and salt. Set aside. Bring milk and butter to boil, in a medium pan. Remove from heat and set aside. In a large dish beat eggs using an electric mixer, at medium-high speed for about a minute. Add 1⅓ cups of sugar and vanilla and beat until light and fluffy, using high speed. Lower the speed and slowly add milk and butter, then add flour and beat until well combined. Put in the baking pans. Bake for 20-22 minutes, or until the toothpick comes out clean or with some crumbs on it. Take out of the oven and leave in the baking pans for a couple of minutes to cool, and then transfer to a wire rack to cool completely. Combine sliced strawberries with ¼ cup sugar. Cover with plastic foliage and keep refrigerated for 15-20 minutes. In a large dish beat heavy cream for a minute, at medium speed, and then add ¼ cup sugar and vanilla. Beat for about 3 minutes at high speed until soft peaks form. Take strawberries from the fridge and drain the extra liquid. 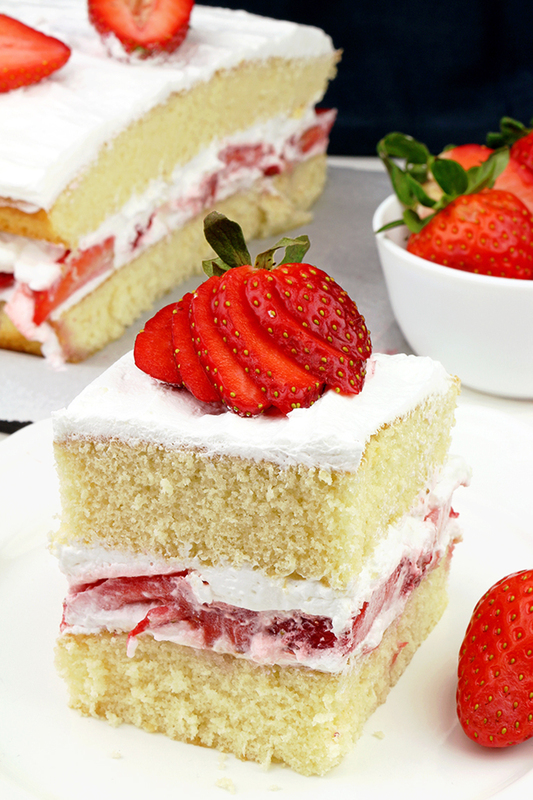 Place the first cake layer and cover with ⅓ of heavy – whipping cream filing. Put strawberries on top. Place the other third of heavy whipping cream. Put the other cake layer on top and press gently. Cover with the last third whipping cream filing.